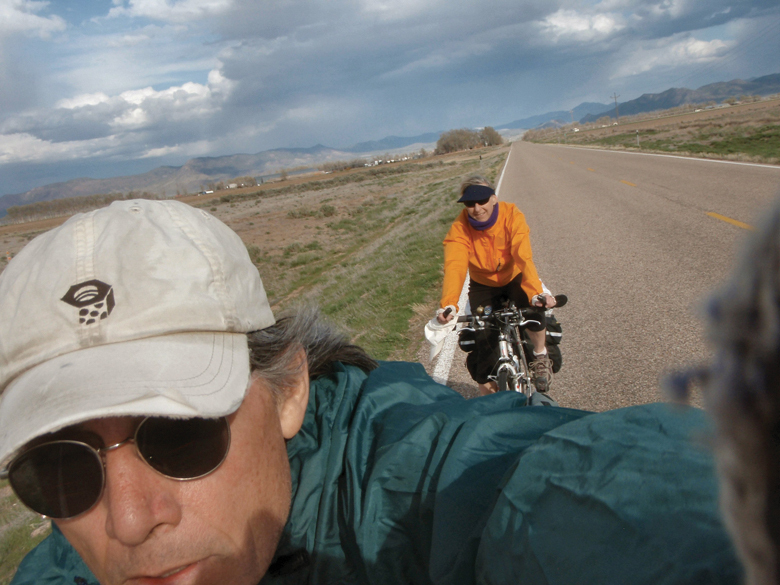 Roz is cruising east toward the Beaver Dam Mountains of Utah. To begin this story, one has to think back to those soggy days of last April when the prospects of a warm, dry summer seemed so far away. The unseasonably cool and wet weather of spring looked like it would go on forever. Like all serious desert dwellers, we were glad of the moisture, but we were anxious to get outside for some fun during our precious spring break. 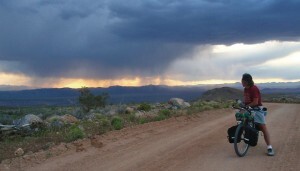 Roz and I had planned a quick, 4-day tour of the deserts immediately west and south of Salt Lake City, but the prospects of more rain and snow on top of the record amounts we'd already received during April were a bit much for us. It was break time and we desperately needed to get outside. After checking out the National Weather Service forecast one last time, my sweetheart and I looked at each other and decided, then and there, to go to Plan B. We loaded up the truck and headed south to St. George, Utah. 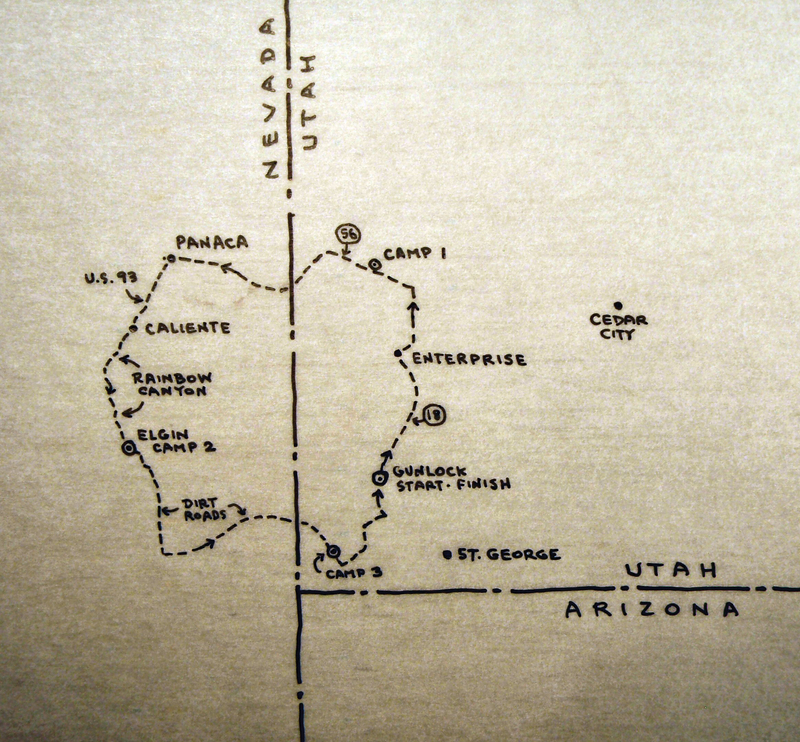 Our Plan B would take us out into the canyons and valleys west and south of St. George along the Utah/Nevada state line. We would ride through a lot of pinyon and juniper country as well as parts of the Mojave Desert ecosystem in the very southwest corner of Utah. We knew the deserts would be beautiful, but we hoped we'd see some sunshine, too. We would travel carrying all that we would need. After spending the night at a cheap motel in St. George, we drove up the Santa Clara River to Gunlock State Park and parked the vehicle in the boat ramp parking lot. The ramp was being refurbished, but the ranger on duty assured us we'd be out of the way. We paid our fees, loaded up the bikes and rolled on up the road to the north. It was a glorious spring day there along the banks of the Santa Clara River. The sun was shining and the air was deliciously clean, with a few of those gentle “puffy white” cumulus clouds floating here and there in a bright blue sky. We moved slowly upstream, getting the feel of our loads, stopping frequently to make subtle adjustments. Flowers were blooming everywhere. We pedaled through the sleepy community of Gunlock, stopping to smell the lilacs and to check out the abundant bird life along the rushing river. After a few leisurely miles we began a short, steep climb that took us up onto the flats above the river valley and on to the town of Veyo. We resisted the temptation to stop for pie in Veyo (when we're on tour we are nearly always ready for pie!) and carried on to the north along Utah 18. The road was quiet that morning, and there was plenty of shoulder for us to use. We also had a bit of a tailwind to help us with the gentle uphill grade that would take us up and over the pass towards the town of Enterprise. Things were looking very good. There were flowers everywhere, and the junipers and sage that covered the hillsides and valley flats were multiple shades of vibrant green. climb onto the southern slopes of the Beaver Dam Mountains. We passed the entrance to the Mountain Meadows Massacre historical site and decided to stop for a look-see. We rode up the short path to the crest of a small hill where we found a grand view of the “meadows” below where the infamous massacre occurred so long ago. I was impressed by the development of the site. It wasn't much more than a wide spot in the road when I passed this way on another tour years ago. I was pleased that the powers-that-be had acknowledged the importance of those tragic events. We continued north up the road and over the pass, then coasted on, down the hill beyond and into the southern reaches of the Escalante Valley. The valley itself was lush and green in the late-afternoon sunshine, with meadows and hay-fields stretching out to the north and east. 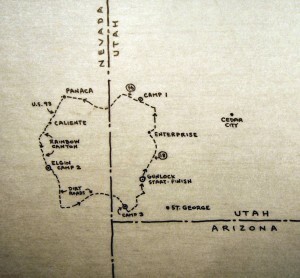 We took a short detour into Enterprise, Utah and spent a delightful hour or so at Marv's Restaurant. We met and chatted with Marv and his wife and were made to feel very welcome. The fish dinners we gobbled as an afternoon “snack” were delicious! After letting everything settle a bit we headed back out of town. With the help of a healthy afternoon tailwind we sped north to Beryl Junction and the intersection of routes 18 and 56. By this time it was getting to be rather later in the afternoon, and the winds from the south had intensified. We took a break in the lee of an abandoned store, then headed west toward the Nevada border. When we're out on a tour, we especially enjoy the early-morning and late-evening hours of the day. The local folks are home from work, so the roads are usually quieter, and the light quality of those hours can be wonderfully soothing and inspiring. Despite the severity of the side-winds that evening, we settled into an easy pace and enjoyed the views. We ended our first day on the edge of a circular field a few hundred feet from the roadway, tucked into a mix of green grasses. It was a fine camp spot. The site was flat, and there was nothing to obscure our views in any direction. The winds mellowed out as the sun set, and the cool evening air filled with the sounds of birds and sweet smells. We set out the ground cloth and pads, unstuffed our sleeping bags and bivy sacks, then settled down to marvel at another magnificent Utah sunset. After a satisfying breakfast of java, oatmeal, fruit and nuts, we loaded up and carried on down Highway 56 to the west. The air was calm and fresh on this morning, but we found ourselves bundling up a bit to ward off the morning chill. As we approached the Nevada line we took a short detour to check out the community of Modena. There isn't much to the town now, but it clearly was an active railroad town at one time. The shells of once-impressive buildings stood here and there, and Roz and I found ourselves envying the peaceful solitude enjoyed by those folks who still live there. The south winds of the previous day were gone and we found ourselves cruising along nicely with the help of a gentle flow of air from the north. The open country was generally flat, and there was a decidedly greenish quality to the scene, but here and there we could see the rough and rocky geology of the region exposed in nearby bluffs and ridges. We crossed into Nevada and began the steady climb to Panaca Summit. The open flats gave way to pinyon and juniper, and stretches of hazy color where fields of purple and yellow wildflowers grew. We stopped here and there to stretch and munch and, at one point, to chat with an old touring buddy who just happened to be driving through on his way from California to Salt Lake. By the time we made the summit, it was mid-day. The sun shone brightly and the cool breezes of the morning had petered out. It was warming up! However, the riding conditions couldn't have been better as we dropped off the summit and, for the most part, coasted the ten miles into the peaceful town of Panaca, Nevada. Everything was picture-perfect in Panaca. The trees were in full-leaf, the lawns and gardens of the town's residents looked very inviting, and the grocery store had all the salty snacks and cool drinks we could ask for. We settled onto the lawn of the local ward house and relaxed in the shade for a while to talk about the next phase of our adventure. Just west of Panaca we hooked onto U.S. 93, a fairly busy road that services much of eastern Nevada. We started heading south through a well-watered valley on a very reasonable highway shoulder. There were ranches and pastures and hay fields, and plenty of roadside homes. We were left with the impression that we were seeing this part of Nevada at its best. We followed the road through the valley, then into a canyon that had been carved over time by Meadow Creek. 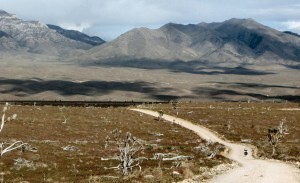 After a few miles of twisty turns, the creek and roadway led into the town of Caliente, Nevada. Caliente clearly is a railroad town. A series of tracks divides the community into two parts. There is a modest “downtown” and plenty of cozy little houses everywhere. We were impressed by the friendliness of the folks we met, but it was apparent that, like many rural towns across the country, Caliente had seen better days. We sat at the bar of a restaurant in the late afternoon, had another deliciously-greasy meal washed down with plenty of iced tea, then moseyed out of town. The main highway climbs west up, and out of the canyon, but we were determined to carry on south through Rainbow Canyon, on a minor paved road that paralleled the creek. The traffic died down to nothing as we followed the twists and turns of the lush, green canyon. There were birds and flowers everywhere, and the sounds of the creek mingled with those of the occasional train that used the canyon to haul freight to and from Las Vegas and points west. The riding was as good as it gets: a quiet road in the early evening; a gentle downgrade; beautiful vistas and surprises around every bend in the canyon; and a subtle north breeze to push us along. We finished that day on a minor bluff above the road and the “ghost town” of Elgin, Nevada. The sun had long disappeared over the canyon rim to the west, and we set up our simple camp as the last light of the day faded away. We watched the stars come out into a clear sky as we listened to the yips of a family of coyotes on the hillside on the far side of the canyon. We slept well, but we were awakened now and then by the passing of freight trains on the tracks below. The morning light gave us better views of Elgin. An old schoolhouse seemed to be all that remained of the town, although here and there we could make out the foundations of long-gone structures out in the brush on either side of the creek. We continued riding south alongside the creek, but at this point the road had turned into a well-graded dirt road. We took time to refill our bottles with filtered water from the creek knowing we might not find water until the following day. Our normal carrying capacity is about six liters each, and we know that that quantity will meet our needs for at least 24 hours. After a few miles of easy morning riding through groves of cottonwoods and past the occasional creek-side ranchette, the canyon opened up. We were able to see raw and rugged mountains off to the south, and we found ourselves moving further away from the serenity of the creek. We left the road at Lyman Crossing and began to climb steeply to the east along the less well-developed Rainbow Pass Road. By this time the coolness of the morning had given way to a bright, hot sunny day. The juniper and pinyon were long gone, replaced by the otherworldly shapes of Joshua trees and greasewood. There were still plenty of flowers everywhere, but we definitely had left the high desert of the Great Basin and entered into the drier regions of the Mojave. We spent hours meandering east through the Tule Desert along a very serviceable dirt road called the Snow Valley Road. The clear skies of the morning were tempered by occasional shadows cast by beautiful cumulus clouds that continued to build as the day progressed. Everything about the countryside was green and lush. The desert plants looked vibrant and healthy, and birds flitted here and there all day long. We passed quite a few healthy-flowing springs and wells, but we didn't see a single soul until quite late in the afternoon, and only after we had crossed back into Utah. The clarity of the air and vibrancy of the living environment around us were irresistible, so we found ourselves stopping frequently to check out any little thing that caught our eyes. Late in the afternoon we dropped off a surprisingly steep bluff into Beaver Dam Wash. We forded the creek at the Little Ranch Preserve then began the climb up and onto the southwest flanks of Beaver Dam Mountain. The evening hours had begun, and the “traffic” began to pick up a bit. At one point we stopped to relocate a desert tortoise from the middle of what had become a well-graded road. As we continued to climb we could see rainsqualls here and there to the south and west. They were moving our way, so we stopped off the side of a very minor road and pitched our tarp tent just in time. Hunkered down in our breezy shelter as the light of the day faded away, we enjoyed a tasty meal and the delightful sounds and smells of a cool desert rain. It rained, off and on, throughout the night, but the morning light brought calm, crystal-clear skies and superior sights and smells. We lingered over our morning meal as we waited for the sun to dry our shelter, then we loaded up and carried on down the road. By mid-morning we intersected Old Highway 91 and pavement. This highway was once the main route into Utah from the south, and we occasionally passed the remains of what must once have been retail operations along the side of the road. The traffic was light as we made the slow climb up and over the Beaver Dam Mountains. We took a break at the top to munch a snack or two and to layer-up for the cool cruise down the other side. The plummet from the summit was a breeze, and the red rock cliffs and mountains to the north were glorious in the clean desert light. We stopped a lot on the way down, in part to give our hands a break, but also to make our adventure last just a bit longer. We eventually bottomed out at the Santa Clara River, then slowly climbed the few remaining miles back up the river to Gunlock Reservoir and the parked truck. After loading up, we headed back home, relishing and reliving the successes of our Plan B along the way. After many years and many trips we remain convinced that there really is no better way to experience new ground or old familiar places than from the seat of a touring bicycle.